The ultimate in food fusion technology. Singaporean cuisine is the very essence that represents it's very successful cultural and racial diversity and the emergence of a new blend of cultures. Singapore food is mainly influenced by native Malay, Chinese, Indonesian, Indian, Peranakan and Western traditions. As Singapore grew due to it's strategic location other influences also enter the scene like Sri Lanka, Thailand, Philipines and the Middle East. This is a country where anything goes in a culinary sense, you'd find Chinese chefs experimenting with Indian ghee or Malay tamarind, or you'd find Western chefs serving up a fried noodle with salads. Eating out is a favourite past time for Singaporeans, most food consumption happens in hawker centres and food courts, not in restaurants. This is primarily why eating out is so fabulous in Singapore, you can find all sorts of cuisines in these places from Vietnamese pho, to fried kway teow, or cockle omelette with fried carrot cakes, the combinations is just endless, but most of all it's the price that counts. A very standard dinner with a main, a soup and a drink would run anywhere from $4 SGD to $8 SGD, no matter where your from this is a killer price for such a broad diversity of food. 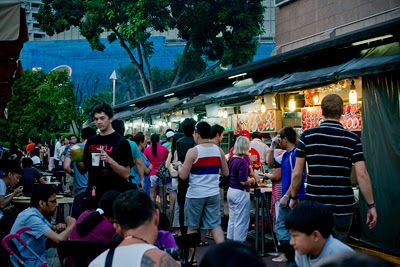 Food plays a vital role for Singaporeans, it's declared as a national pastime, a national obsession. Food is often a topic of conversation among Singaporeans. Religion, just like food is also a very significant part of Singapore, in a way that it's very diverse and well respected. 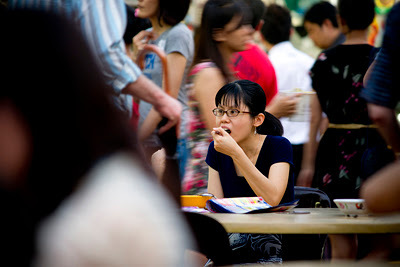 There are a few common dietary strictures in Singapore that visitors should know before stepping abroad, Muslims do not eat pork and Hindus do not eat beef, Buddhist do not eat meat, some Taoist do not eat beef, then there are vegetarians and vegans who are not religious also. People of different backgrounds often eat together, while being respectful of each other's culture and religion, and this is where the beauty of hawker centres come in, you have numerous small food stalls in one place, everyone can have what they want and they can buy it themselves. Singapore cuisine has been promoted by the Singpore Tourism Board as a tourist attraction. That's why the governement organises the Singapore Food Festival every year in July to celebrate the multiculturalism of the local foods. With themed celebrations, culinary workshops, also competitions organised island-wide, the month long festival has escalated Singaporean diversity of food on an international scale.